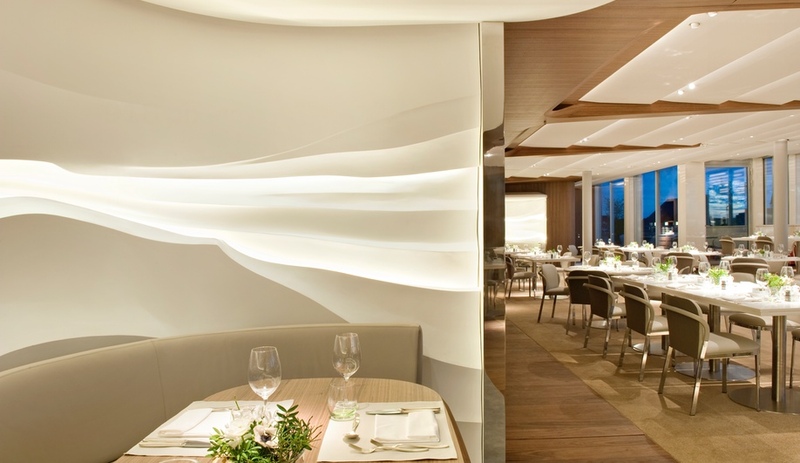 For the Bayerischer Hof Hotel – which is to Munich what the Ritz is to Paris – Jouin Manku has crafted a series of dining spaces that take their inspiration from the city and the mountains beyond. 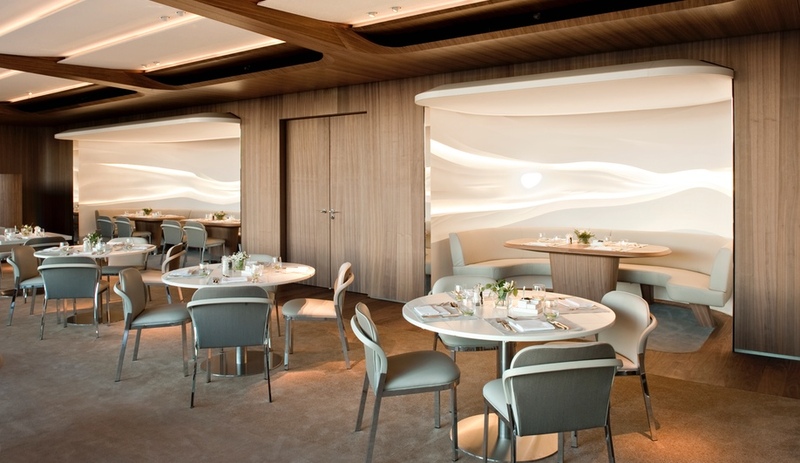 Paris designer Patrick Jouin has been crafting show-stopping restaurants for years, most notably for star chef Alain Ducasse. 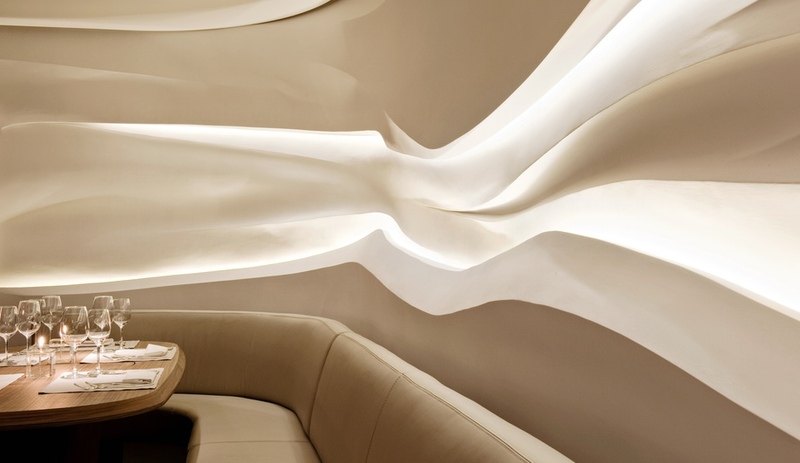 It was for Ducasse’s Mix bistro, which opened in Las Vegas in 2004, that Jouin assembled the world’s largest hand-blown glass chandelier – a cascade of bubbles that he would later develop as the Ether 90 light fixture. Produced by Murano Due, it went on to become the centrepiece of many dining spaces by other designers. 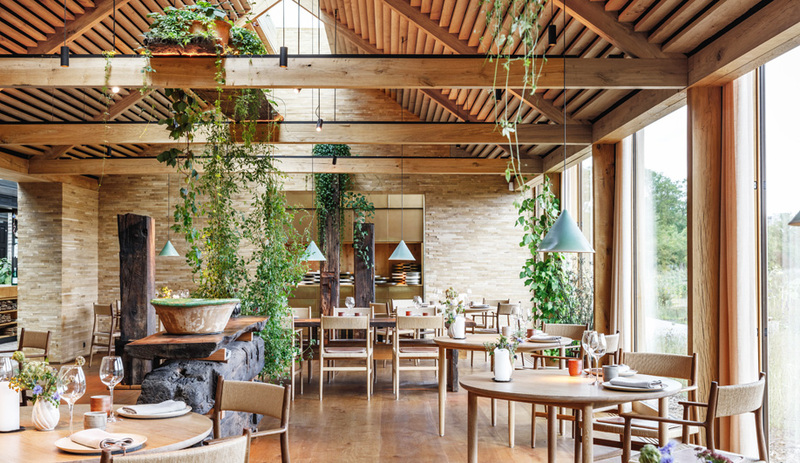 Now, with collaborator Sanjit Manku, and their design agency Jouin Manku, he envisions brilliant restaurants for high-end hotels. 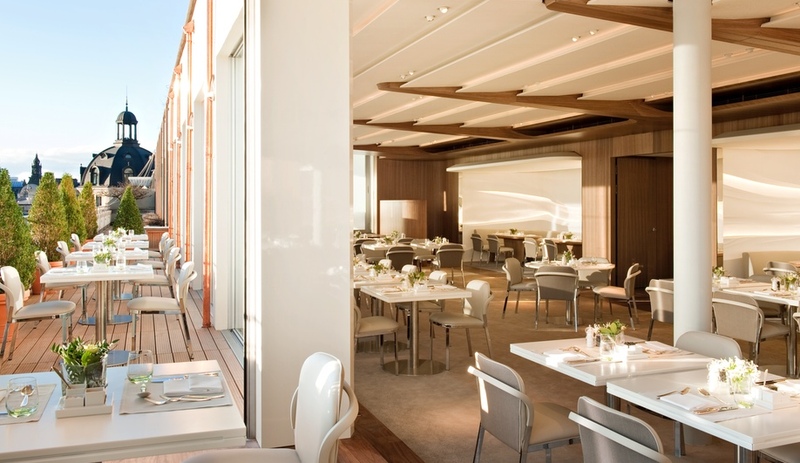 Recently, they have been at work on spaces for the Bayerischer Hof. 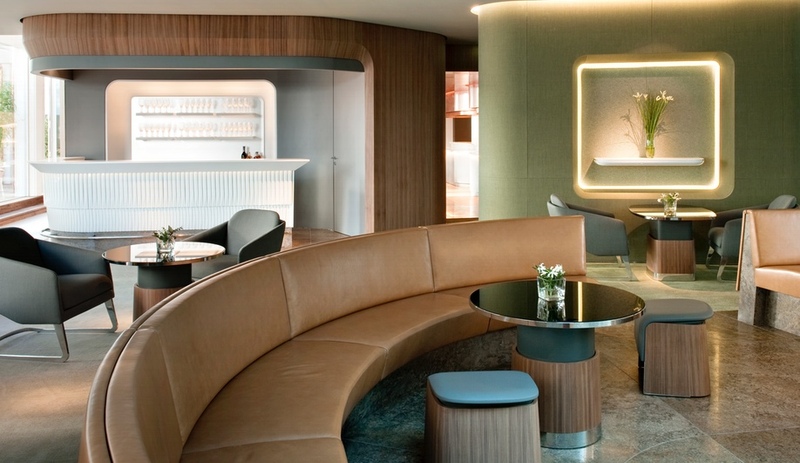 Throughout the years, this palatial Munich hotel dating back to 1841 has invited designers to create individual social zones, such as its spa by Andrée Putman. Now, Jouin Manku has revitalized its Roof Garden Restaurant and Lounge, and is putting the finishing touches on a third, and more intimate, space that will be “perched above the city” and play host to a single table of six patrons. 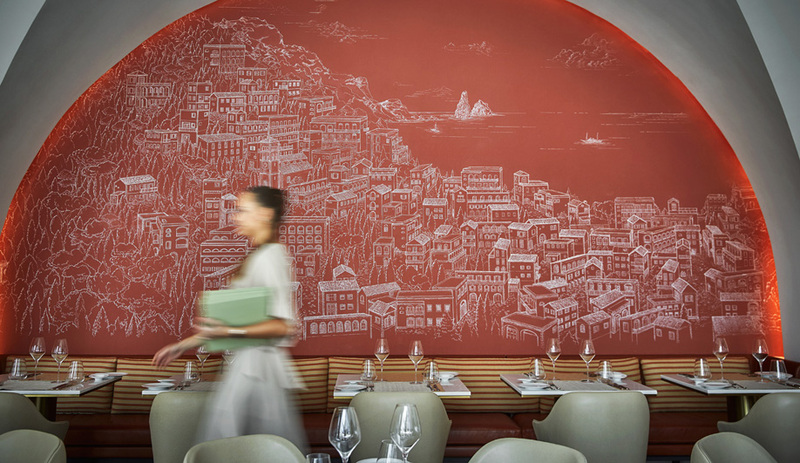 For the main dining room, the firm took inspiration from the Bavarian mountains, which can be glimpsed beyond the Frauenkirche cathedral from the restaurant’s terrace. Into the walls lined in American walnut, it carved out three dining nooks that play up the theme of a “mineral horizon made of stone and snow, like a scene carved out of rock.” The alcoves’ interior walls are made of Siporex, sculpted, plastered and backlit to evoke sunlight hitting snow-capped peaks. 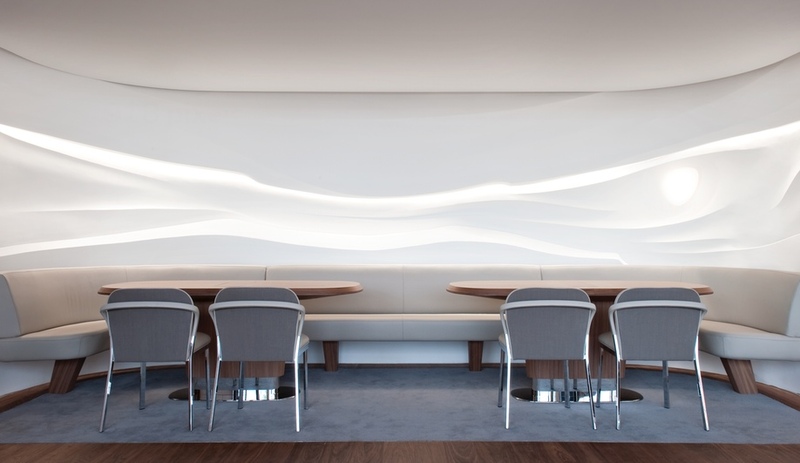 Along the ceiling, fabric-covered panels dotted in silver are placed between the bevelled-edged beams to complement this effect, and create a movement of waves towards the terrace. 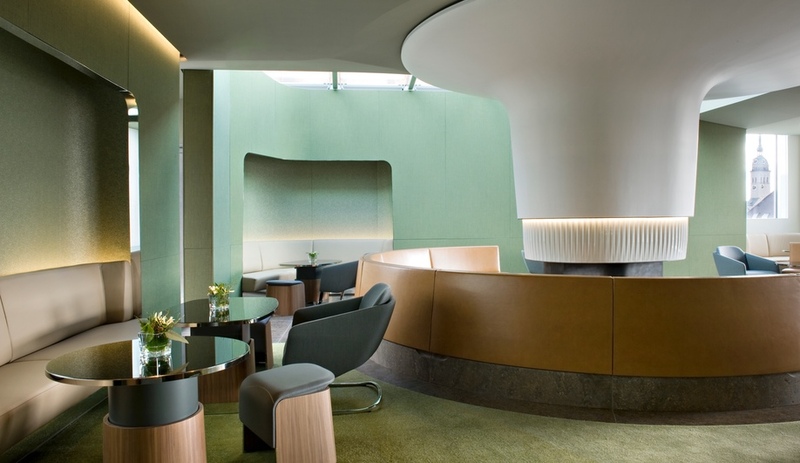 The lounge takes the nature inspiration in another direction, with a green palette and an enormous fireplace. This moulded-plaster sculpture, fringed in striped porcelain tiles, anchors the room, the lounge seating completing the cozy vibe in a campfire arrangement. 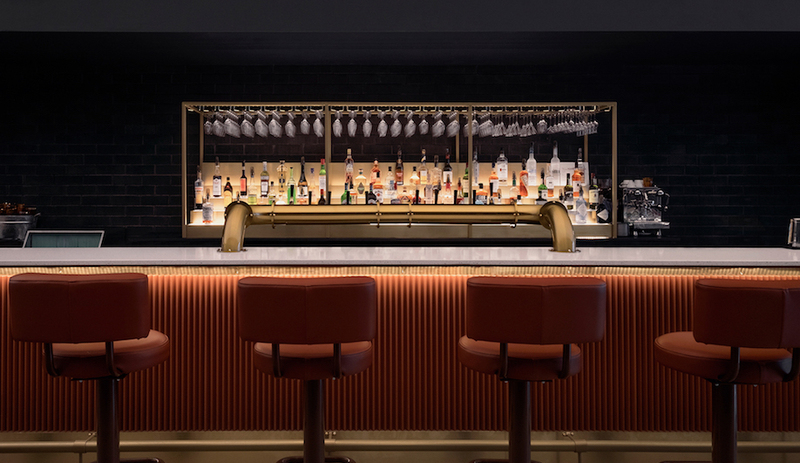 Also fronted in porcelain tiles, the bar is topped in Corian and capped in wood – a multi-textured volume that shows no element in these spaces was an afterthought. 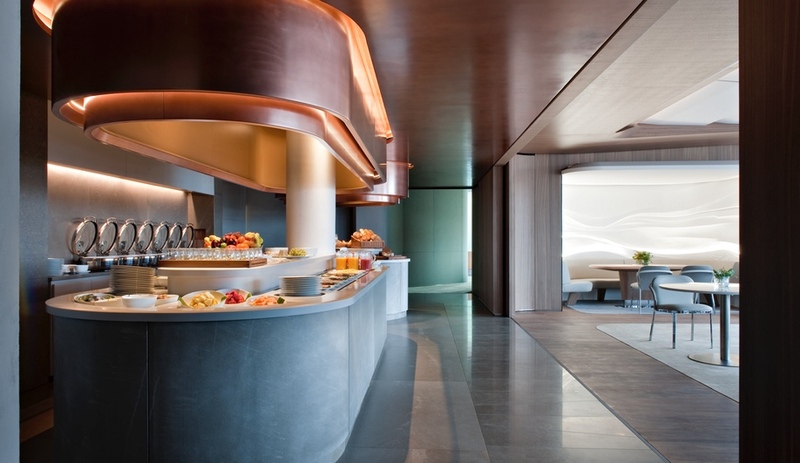 Even the buffet tables – often the least inspired part of a hotel’s dining room – are a sight to behold, with their copper hoods evoking the pots and pans that dangle above a chef’s head. 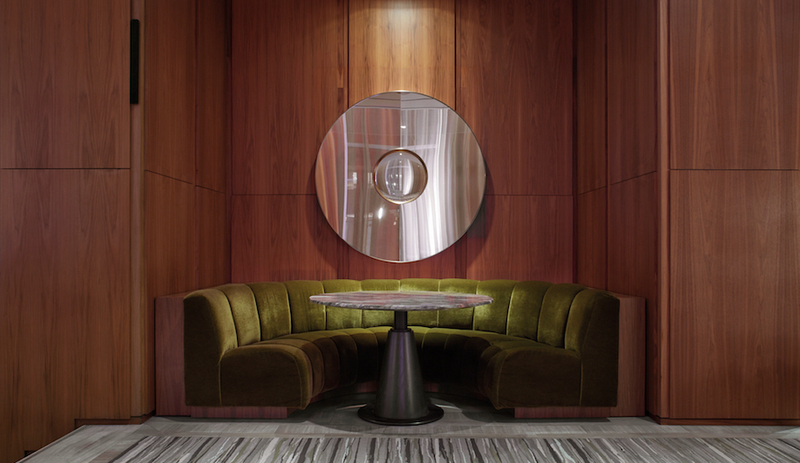 The final and most intimate space, set to open soon, will connect the lounge to Putman’s spa and tie the whole series of spaces of together.